Big Foot is based on a camping theme but with a difference. Campers often tell tales of seeing giant footprints of some unknown creature in the wilderness. This legendary creature has come to be known as Big Foot. Big Foot is the wild symbol and his Footprint is the scatter symbol. The other thematic symbols are the Camper trying to establish radio contact, the beautiful Sunrise, the Campfire and the Road Sign. The high value card symbols are simple in style and in vivid colors. The reels are set in the background of a beautiful green wilderness with the sun rising in the orange sky and footprints of Bigfoot along one side. During the free spins the background changes to a winter scene with the ground and trees covered by snow. 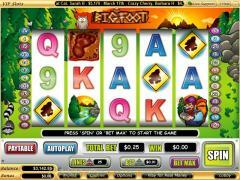 There are 25 paylines in the Big Foot slot game and it is advised that players wager with all paylines enabled. This is because pay table combinations only pay out if they occur in an enabled payline. The coin size range starts at 0.01 and goes to 10.00 with a total of 7 stops. This provides considerable flexibility to the betting options despite players being constrained to wager only one coin per payline. 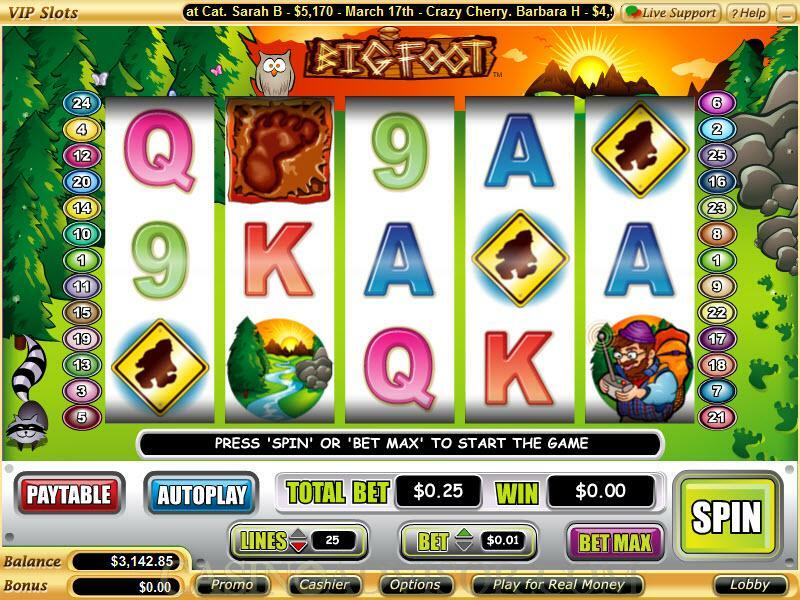 Both low rollers and high rollers will be attracted to Big Foot slot game. Big Foot is the wild symbol and it appears only on reels 2, 3 and 4. It does not offer any payouts and in normal spins it does not multiply payouts. Two or more Footprint symbols appearing anywhere on the reels offer scatter payouts. Three or more Footprint symbols appearing anywhere on the reels trigger the free spins bonus round. The scene first shifts to the second screen in which five pairs of eyes are displayed in the dark. The player gets three turns to identify eyes belonging to Big Foot. If the player makes the correct identification in the first turn he is awarded 20 free spins, if he makes the correct identification in the second turn he is awarded 15 free spins and if he makes the correct identification in the third turn he is awarded 10 free spins. Big Foot reveals a substitute multiplier of 10x, 8x or 4x. If during any free spin a paying combination is made with the help of the Big Foot wild symbol then the corresponding payout is multiplied by the substitute multiplier. 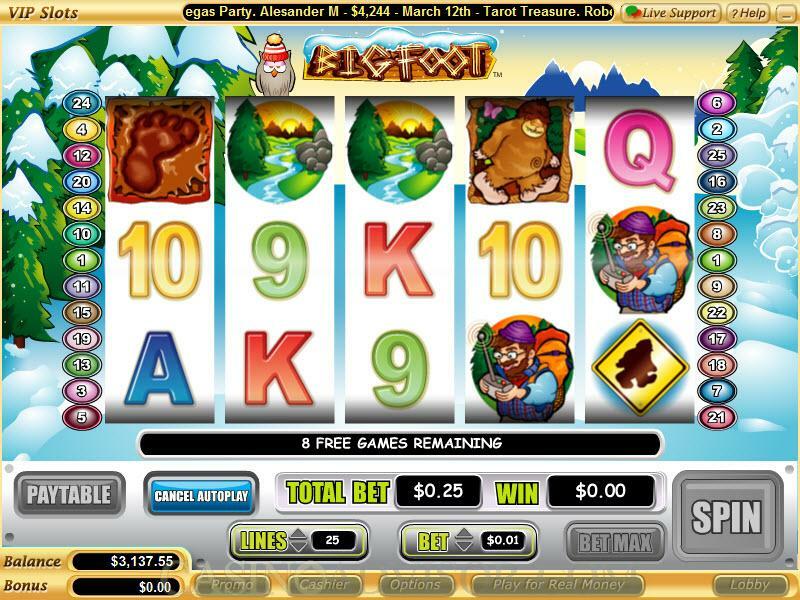 If three or more scatter symbols appear on the reels during the free spins, the free spins are retriggered but at the same number and same substitute multiplier. Big Foot does not offer any progressive jackpot. The highest fixed jackpot of 5000 coins is hit when five Camper symbols appear in an enabled payline. Interested in reading more detailed information about Big Foot? If so Click Here for more details.